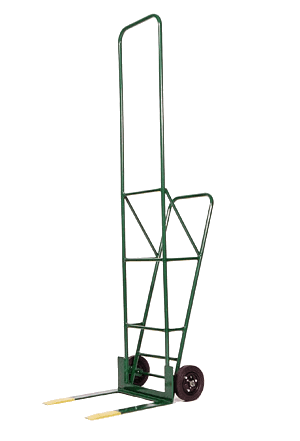 Warehouse Wheeler Hand Truck | Drader Manufacturing Industries, Ltd.
Our Warehouse Wheeler, with customization options, including hard rubber wheels, is suited for handling heavier loads in your warehouse or bakery operations. Designed specifically for warehouse use, this wheeler is used similarly to the way a Route Wheeler is used. The user must support the weight of the load while moving, but the taller height and angled handle both lend themselves better to taller, heavier stacks. Hard rubber wheels available upon request. Available in both 17 ½” and 22” wide forks.